The first regular New York-Bermuda service was opened in January 1874 by the Quebec Steamship Co, which was awarded a contract by the Government of the day. This line was followed by the Furness Bermuda Line, Cunard Line, Holland America Line, Home Lines and Celebrity Cruises, all of whom docked on Front Street in downtown Hamilton. Also included in this crowd was Norwegian Cruise Line. Today, however Front Street has lost its business, a victim of larger ship size. Although Samuel Cunard had operated a service between Halifax and Bermuda from 1833 to 1886, the Quebec Steamship Co provided the first regular connection with New York, and built the first new ships for the Bermuda trade in the 1880s. This company remained on the run until December 1919, when after forty-five years service, it was taken over by Furness Withy & Co Ltd, to become the well-known Furness Bermuda Line. The Quebec Steamship Co had engaged Thomas Cook as passenger agents, and in one of its earliest ventures into the business it began selling these voyages as an early version of a cruise. Mark Twain also travelled to Bermuda at the invitation of the Quebec Steamship Co. Having called there ten years earlier in the sidewheeler Quaker City, on her return from a Mediterranean cruise, he had written "Innocents Abroad" based on this voyage. Following his Quebec Steamship voyage, Twain wrote four articles for "Atlantic Monthly." Appearing in 1877 and 1878, just after his highly successful "Adventures of Tom Sawyer," these were widely read and together with the efforts of Thomas Cook, created a whole new industry for Bermuda. Twain himself was prone to seasickness. One of his more famous quotations, not used in connection with the tourist trade, was "Bermuda is a paradise, but you have to go through Hell to get there." In a more positive vein, he wrote "you may go to Heaven if you want to. I'd rather stay here." When the Princess Hotel opened on January 1, 1885, named for a visit by Princess Louise, fourth daughter of Queen Victoria and wife of the Marquess of Lorne, Governor-General of Canada, the islands' future was assured. The Furness Bermuda Line came on the scene after World War I and introduced a series of different liners, each one larger than the last until the famous twins Monarch of Bermuda and Queen of Bermuda of 1932-33, which became known as the "millionaire's ships." These three-funnelled sisters were as well known in New York as the Queen Mary, although in size they were only 580 feet long and 76 feet wide. By way of comparison, the Azamara Journey, which is now regarded as a cosy-sized ship and spent her the 2007 season on the New York-Front Street run, is 592 feet long and 83 feet wide. Furness Bermuda lasted on the New York-Bermuda run a year or two longer than the Quebec Steamship Co, except for the years of the Second World War, finally selling the now thirty-four year old Queen of Bermuda for scrap at the end of 1966. Thereafter, Cunard Line took over the contract for a few years with its Franconia, and the Greek Line joined in with its similarly-sized Olympia. These older ships were supplanted in 1971 by Flagship Cruises, who built the Sea Venture and Island Venture for the route. When these two ships were sold to Princess Cruises in 1974, the Sea Venture became the Pacific Princess, better known as the "Love Boat." 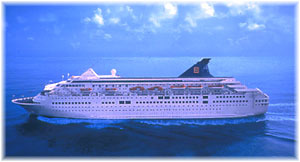 Many years later, between 2000 and 2002, she would return to the Bermuda trade for Princess Cruises.. The run was next taken over by Home Lines, who already held the weekly New York-Nassau contract, and Holland America Line, who had once chartered ships to the Furness Bermuda Line. As well, Flagship Cruises, now owning the Kungsholm, scheduled that ship for a number of Bermuda cruises, several of which also included trips to the St Lawrence and Majesty Cruises ran the Royal Majesty between Boston and St George's, the alternative port at Bermuda's east end. Other than Flagship Cruises, only Home Lines and Celebrity Cruises in recent years have actually built vessels for the Bermuda trade. Starting in 1973 with the second-hand Doric, a very popular ship in her time, Home Lines built the Atlantic in 1982 and added the Homeric in 1986. Both ships were built within the maximum length overall that allowed them to navigate the sometimes tortuous channels into Hamilton and to dock on Front Street. Home Lines, however, which dated to immigrant days in 1946, closed in 1988 and sold its ships to Holland America Line. The Homeric became the Westerdam and was lengthened in 1989 - she trades today as the Costa Europa. The Atlantic, meanwhile, was sold to Premier Cruises for operation from Port Canaveral and today operates as MSC Cruises' Melody in the Mediterranean and South African trades. 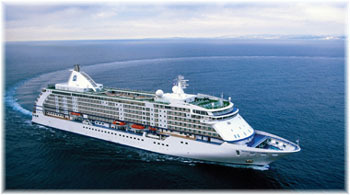 Celebrity Cruises, who succeeded Home Lines on the New York-Bermuda route, started with the second-hand Meridian and added the Horizon in 1990 and the Zenith in 1992. 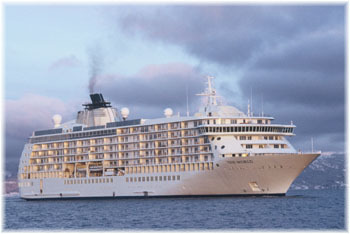 But several years later, Celebrity too would withdraw from the Bermuda trade, with the Horizon going to the affiliated Island Cruises in late 2005 as the Island Star and the Zenith going to another affiliate, Spain's Pullmantur Cruises, in early 2007, to trade in the Mediterranean and Brazilian trades. Since the Zenith sixteen years ago, no new ship has been built for the Bermuda trade and in today's world of economy of scale, it seems unlikely that one ever will be. The survivor today, it has to be said, is Norwegian Cruise Line, which last November signed a contract that will make it the big player in Bermuda. 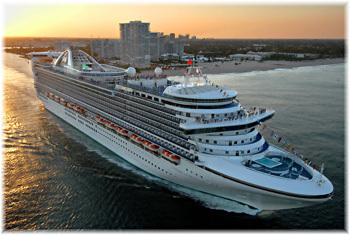 With the 2008 season, it has also become the only line to offer the traditional 3-night stay in Bermuda. Royal Caribbean comes a close second but not one of their ships, nor NCL's, now calls on Front Street, as with the trend to bigger ships they are all too large to get there. NCL has been playing in the Bermuda market for many years, but never until now as the main contracted line. Its new ten-year contract, however, which will take effect in 2009 and run until 2018, calls for the Norwegian Dawn to sail weekly from New York and the Norwegian Spirit weekly from Boston, each making at least twenty-two calls each season. A third ship, the Norwegian Majesty, the old Royal Majesty, will operate from Charleston, Philadelphia and Baltimore to the port of St George's. During 2008, NCL will make 68 Bermuda calls, accounting for 60% of the 112 regular callers this year, or half of all calls. The Norwegian Spirit sails weekly from New York, the Norwegian Dream from Boston, until she goes to Louis at the end of the season, and the Norwegian Majesty from ports south. No provision has been made for Charleston, Philadelphia or Baltimore beyond 2009 so there will be further negotiations here. Meanwhile, as part of its contract, NCL will partner with local restaurants to offer discounted shoreside dining and will also support the Bermuda Music Festival and other local institutions. Royal Caribbean, meanwhile, as successors to Celebrity, and a single season by Azamara, now plays definite second fiddle to NCL. 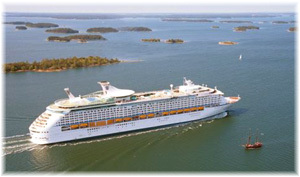 It continues regular calls at Bermuda with its Explorer of the Seas, with twenty-one calls from Bayonne, NJ, and the Grandeur of the Seas with fifteen calls from Baltimore. The Brilliance of the Seas and Navigator of the Seas, both on Transatlantics, and Jewel of the Seas, from Boston, will each make a single call as well. Princess Cruises, meanwhile, will make eight sailings with Caribbean Princess from Brooklyn, but all these calls by Royal Caribbean and Princess will be for just one or two-nights. This new cruise terminal for larger cruise ships has been operating at the former Royal Naval Dockyard in Bermuda's west end for many year's now and nearby features include the Dockyard itself, the Maritime Museum, the Bermuda Dolphin aquarium, shopping and a pub called the Frog and Onion. However, for those who don't know, it's a long way to Hamilton, and even with the recent introduction of fast ferries in recent years, it takes half an hour to get into town at best. While the ferry ride itself might only take 15 minutes, there is also the waiting and terminal time, and the fare of $4 per person. The web site Bermuda On Line has commented on the situation as follows: "The government states (but some would-be passengers have objected) that visitors will have more time on the island and, as part of declared government policy for the changes, spend much more money than before, including eating in Bermuda restaurants instead of eating on board the cruise ships as part of their cruise package. Some passengers, used in the past to just walking off the ship and wandering by foot into the city and town respectively, or expecting to do so, instead will now have to go a long distance by bus or taxi or moped to get to them; and be deprived of the meals, for which they paid as part of their cruise package, on board the cruise ships." The 2007 season was the last boom season for Front Street. It saw regular calls by all of the Azamara Journey, standing in for Celebrity's Zenith, the Norwegian Crown, now Fred Olsen's Balmoral, and the Empress of the Seas, now joining Zenith with Pullmantur as the Empress. With all three ships now gone to other trades, this leaves only larger ships to serve the regular Bermuda run. This season will see only eleven Front Street calls. Included among them are Regent's Seven Seas Mariner and Seven Seas Voyager (twice), Oceania's Regatta and a single call by Azamara Journey, as well calls by luxury ships The World and Hebridean Spirit. In the more mainstream market, Fred Olsen's Boudicca, Phoenix's Amadea, the Club Med II and the little Vistamar are also making single calls on Front Street. A bronze statue of Mark Twain now sits in the main lobby of the Princess Hotel. Not far away, on Front Street where Mark Twain and millions since have docked, Hamilton used to see a hundred or more calls a year. This year, it will see but eleven. While there is a plan to build a new Hamilton cruise terminal at Albuoy's Point, near the present ferry terminal, it doesn't seem to be an active one and one can't help feeling that something has been lost here of an honourable past that runs all the way back to 1874 - that people could walk off their ships and be right in town.